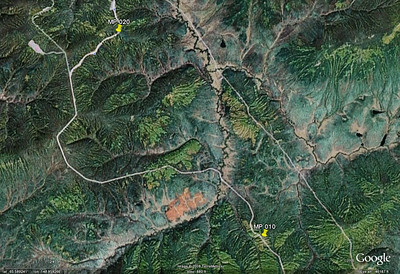 Photos depicting scenes anywhere north of MP10 to just south of MP20. NOTE: Most of these photos were uploaded at full resolution. To see maximum detail, do a mouseover of the photo, and when the menu choices appear along the right hand side, choose "ORIGINAL". 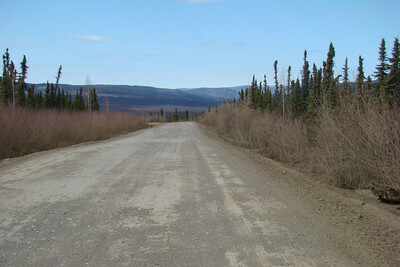 The approximate location of Milepost 10. N65.55298, W148.90552, Elevation: 1277' No actual milepost could be found here. Google Earth view, again showing the pipeline taking the direct route as the oil flows from Prudhoe Bay to the marine terminal at Valdez. 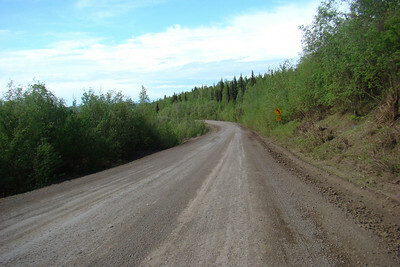 The split in the upper left corner is where the old road continued straight ahead and the new, paved (but with some nasty breaks, so be careful) bypass that eliminates some rough road and steep grades. On a dual sport bike with knobbies, the old road is fun to ride, but can be nasty when wet. 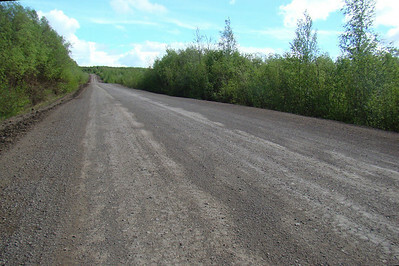 It is also susceptible to washouts, especially in the early spring. 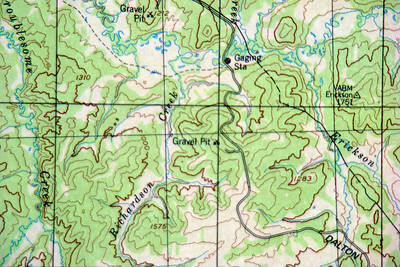 Another topo map section. The Gaging Sta(tion) is at Hess Creek. 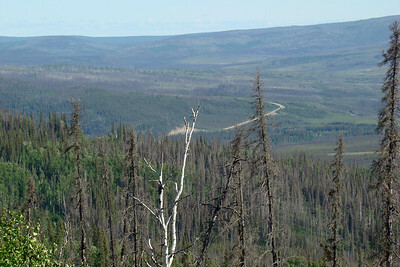 6/5/08 4:01 PM - The view north from the approximate location of MP10. 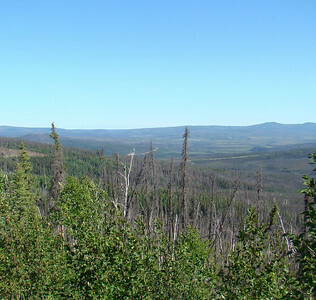 6/5/08 4:01 PM - The view south from the approximate location of MP10. 5/11/08 4:30 PM - MP11 - Looking north. NOTE: Due to the steep hill, narrow road, and ongoing maintenance at MP10, it was too dangerous to stop there so I drove on up to MP11 for these shots. 7/4/08 9:51 AM - As one approaches MP18, the righthand curve at the beginning of the by-pass becomes visible, with the old highway continuing straight ahead. 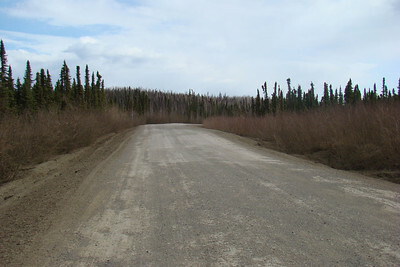 My name for that stretch of old highway is "The Road Less Traveled", and a few photos will help to explain why it is just that. 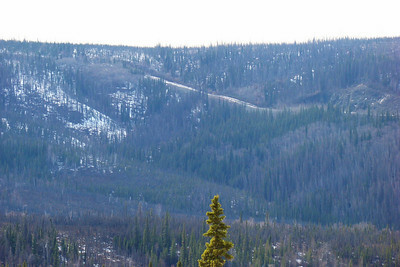 7/4/08 9:55 AM - From the vantage point of just a mile or so in from the south end, a portion of the new by-pass and 25 Mile Corner (at the very center of the photo) can be seen in the distance. 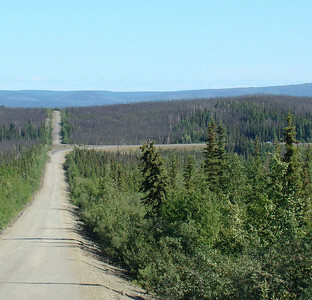 7/4/08 9:56 AM - A telephoto view of 25 Mile Corner, some 5 miles distant by road. 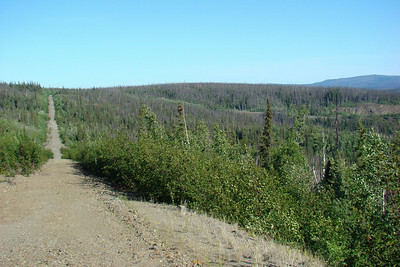 7/4/08 9:56 AM - As the old road, unmaintained since 2004, continues on, it is easy to follow it up the far hill and on down to the right around another hillside. Should have stopped and taken many more photos of this stretch. Now have an excuse to go over it again. 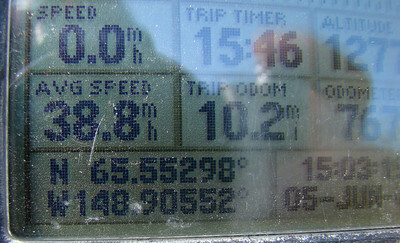 5/11/08 5:05 PM - The steep grade seen here, followed by a series of such grades separated by tight turns, are the reason for the by-pass that added a mere 6/10ths of a mile to the overall distance, and virtually eliminated steep hills at this point. 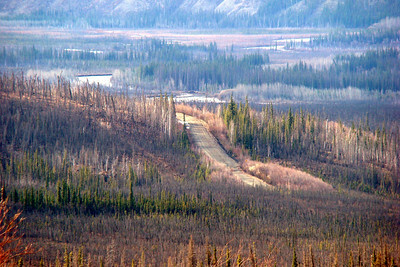 5/11/08 5:06 PM - Hess Creek wends its sinuous path through the flat valley floor, while nearer, the old roadway can be seen where it levels off to join the existing highway. 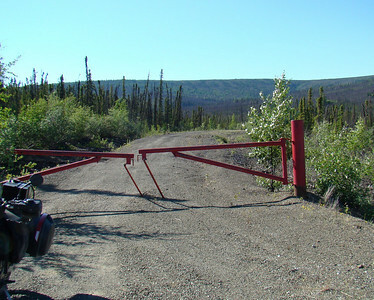 7/4/08 10:12 AM - At the north end of the Road Less Traveled, this unlocked gate might serve to discourage the most timid driver, but serves only as an enticement for dualsport riders.